If you’ve been to a falafel or shwarma stand in Israel, then you have probably heard of amba. 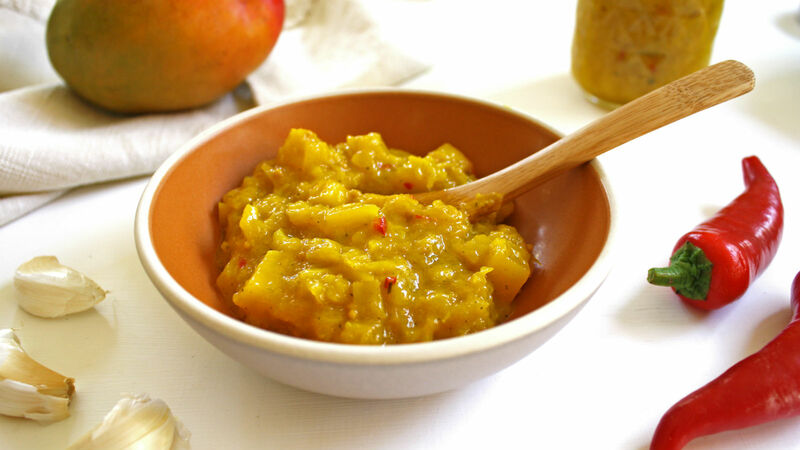 Amba is a spiced pickled mango condiment. Its popularity in Israel comes by way of the Iraqi Jewish community. This flavorful condiment is commonly found in Iraq, across the Middle East, and in India as well. In fact, amba originated in India, and the word “amba” means mango in Marathi. You can find countless recipes and variations for amba, but the main and required ingredient is mango. 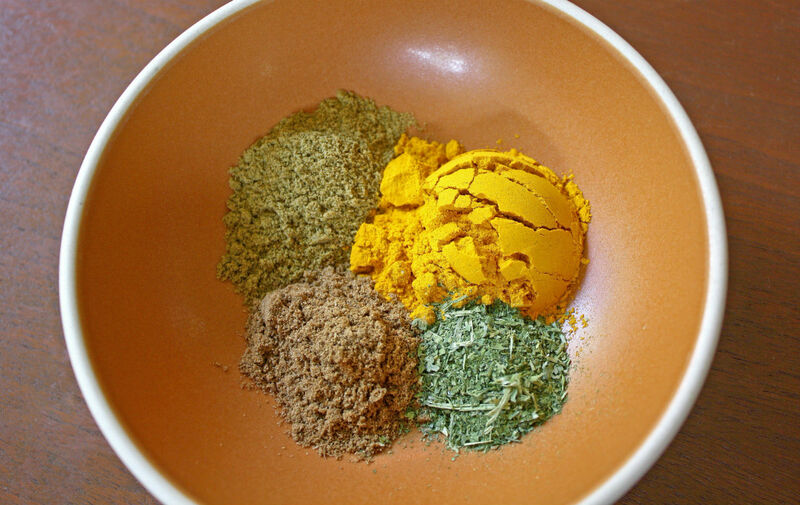 Most recipes also include mustard seed, turmeric, chili, and fenugreek. Fenugreek is an herb that’s often used in Indian, Persian, Turkish, and Middle Eastern cooking. It has a unique maple syrup-like aroma, and can add an herbacious sweetness to a dish. Traditionally, amba is made by slicing and salting green mangoes and placing them in a jar in the sun to ferment for five days. Afterward, the mango is removed from the jar and left to dry out in sunlight for 3-4 hours. Once dried, the mango is simmered with spices and is then jarred for use. You’ll definitely get a deeper flavor if you allow for longer fermentation of the mango, but you might want to make amba when you don’t have access to five sunny days in a row or when you just don’t want to wait that long. Inspired by the techniques of many home cooks, I decided to make a quicker-pickled amba. You still salt the mango, and you let it sit in that salt overnight, but that’s the extent of the wait time. The cured mango then gets cooked with a variety of spices and aromatics, and finally vinegar is added. Amba is ideally made with green unripe mangoes, which can be tricky to find. For this recipe any mango will work, but it is best to use ones that are firm and not fully ripe. This recipe makes a mildly spicy amba; you can adjust the level of heat depending on how much chili and cayenne you add. Skip the cayenne entirely if you don’t like things spicy. Add an extra chili and a bigger pinch of cayenne if you can take the heat. I like amba that is a little thick with small chunks of mango, but if you like yours smoother and thinner you can purée it until smooth and add water to thin it out to your desired consistency. Amba is as versatile as it is delicious, and it is unlike any other hot sauce. In our home we especially like to have it on hand during the summertime because it goes great with just about any grilled protein: chicken, steak, tofu, or fish. It’s also nice to have it on hand for a grain bowl topping. Amba added to some yogurt with a little lemon juice also makes a perfect dip for vegetables or pita chips. Amba adds a tangy, fruity, pop of heat to any dish. Peel your mangoes, then slice the fruit around the pit. Dice the mango into small cubes, they do not have to be even or perfect. Add the diced mango to a large non-reactive bowl. Add the salt to the mango, and toss until everything is well-coated in the salt. Cover the bowl and refrigerate for 1 day. 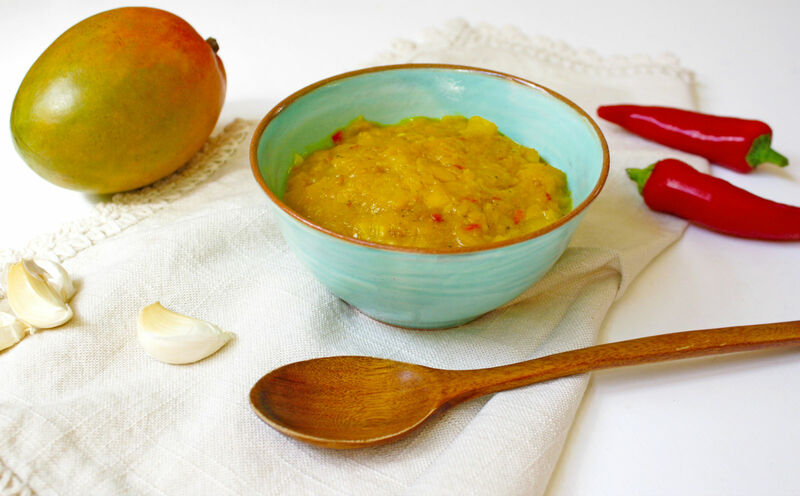 After the mango has cured in the fridge, over medium-low heat add oil to a large pot or deep sauté pan. Add the mustard seeds to the oil, and when they begin to make popping sounds add the finely minced garlic and diced chili. Sauté until softened and fragrant but before anything begins to brown, about 2-3 minutes. Add the remaining spices: turmeric, fenugreek, coriander, cumin, and cayenne. Stir and sauté for an additional minute. Add the mango, brown sugar, and water to the pot. Stir, increase the heat, and bring the liquid up to a simmer. Simmer for 5-6 minutes, or until the mango has softened and the liquid has slightly reduced. Turn off the heat and add the vinegar to the mango mixture. Taste and adjust to your liking by adding more vinegar, sugar, salt, or spices if needed. Using an immersion blender or blender, purée the mango to the desired consistency. I like mine a little chunky with about half of the mango pieces still intact. If you would like your amba smoother you can purée it for longer and add water to thin it out. Note that amba will thicken slightly as it cools. Once cooled, transfer the amba to jars and refrigerate. Amba keeps well in the fridge for about 2-3 weeks.